OMAHA, Neb. — There will be a Game 3 in the 2018 College World Series Championship, as No. 3 Oregon State and No. 5 Arkansas battle in a winner take all final time at TD Ameritrade Park here in Omaha, Thursday. First pitch for Game 3 is slated for 6:30 p.m. ET Thursday night, as college baseball fans brace themselves for a new national champion. Oregon State forced a third game when it stunning completed a comeback in the bottom of the ninth to delay any early celebrations and stay on track to win a third national title. Trailing 3-2 heading into the final inning, the Beavers scored three runs during that period to win the game 5-3 and force a decisive Game 3. Shortstop Cadyn Grenier tied the game at 3 with an RBI single to left-field before Travor Larnach hit a two-run home run into the right-field bullpen to give Oregon State the win. 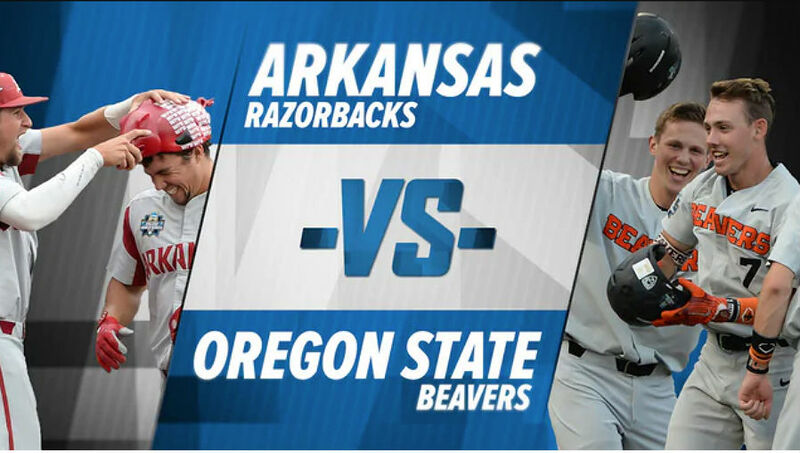 The Beavers had scored runs in the fourth and fifth innings to take a 2-1 lead, but Arkansas responded with a pair of runs in the bottom of the fifth to reclaim their advantage. “What do you do?” Van Horn said. “You got a chance to play for the national championship going down to the last day. “Just gotta fight through it. “It was quick. It was just, ‘hey, we get to play one more game.’ And what more could you ask? You gotta move on, you can’t take it back, you know?